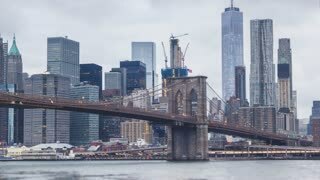 Lower Manhattan | New York City | 4K hyperlapse clip shot from Brooklyn Bridge in the morning. 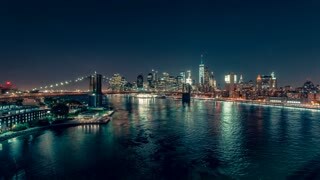 NEW YORK CITY, Circa June, 2015 - A wide shot of the Brooklyn Bridge with skyline of lower Manhattan behind. NEW YORK - Circa December, 2015 - A personal perspective walking over the Brooklyn Bridge headed to lower Manhattan.